Jeans are an essential and versatile element in any man's casual wardrobe. However, what type of jeans do you choose? When shopping for jeans, you'll notice a wide array of styles and fits; many of which sounds similar to each other. In this article, I showcase 7 of the most prevalent fits of jeans for men; along with the typical properties of each. Additionally, I'll also give my perspective on which jeans work best for different body types and demographics. As the name suggests, loose fit jeans are generally the baggiest available in retail stores. There is plenty of excess fabric throughout, resulting in stacking and folding of the material. These are sometimes also labelled as 'regular fit' (depending on the retailer) and offer the most square shape of jeans available. A traditional fit of jeans. These are typically quite baggy, with a noticeable flare from the knee downwards. These are built with the intention to fit over the top of boots easily. These were particularly popular during the 1990's and also tend to fold and stack, especially at the ankles. Straight fit are shaped similarly to relaxed fit, but with a narrower profile overall. Nevertheless, in most cases there is still some bagginess, especially below the knee. This is also sometimes known as 'regular fit' at some retailers. These go straight down, in a rectangular shape, from the hips to the ankle. A more modern fit of jeans, with a narrower cut. These hug the body slightly more closely. Many also taper from the knee towards the ankle area; with a slightly lower rise. These are designed to offer a more tailored aesthetic overall. Though many slim jeans come with some form of lower leg taper, jeans specifically labelled as 'slim taper' usually take it a step further. These have a more noticeable narrowing towards the ankle. These are almost like a hybrid between the slim and skinny fits; with them being like a slim fit above the knee, and resembling a skinny fit below it. A trendy fit of jeans at the moment. Skinny jeans generally aren't as tight as many claim, often being confused with the elusive spray-on/super skinny jeans. That being said, they are a very narrow cut throughout the leg, with extra stretch. 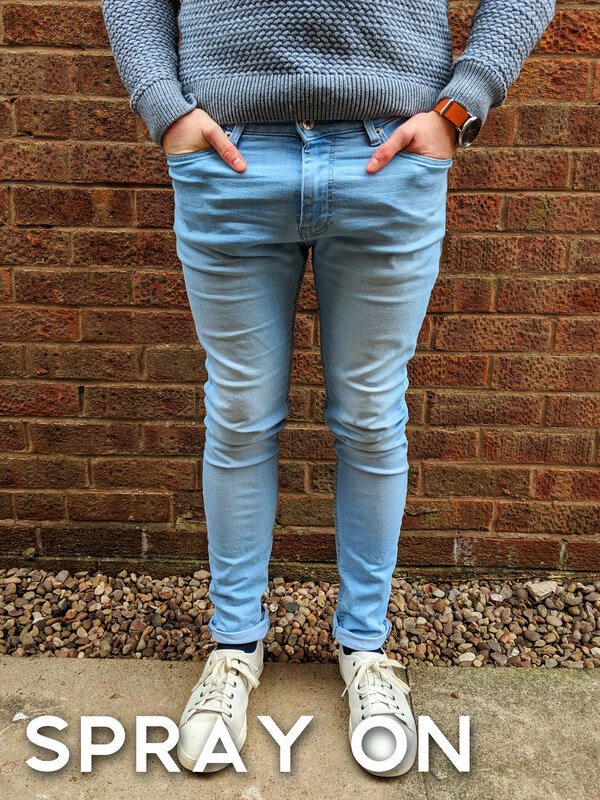 The tightest fit of jeans available in the men's section, often looking like they have literally been sprayed on. You'll have a fun time trying to put these on, with the tiny ankle hole blocking everything but the narrowest feet. I would compare these to the fit offered by popular women's jeans. You can buy whatever style of jeans you want. However, I never actively recommend either of these types of jeans. Why? Because they look gigantic on most men, concealing your natural shape and making the legs look a strange shape compared to the torso. The large amount of excess material also offers a strange aesthetic when walking. Both styles also conceal your shoes. If I have good shoes on, why would I want to cover them up? There are much better options to be found. If you're a guy looking for a mature look, but are looking to avoid some of the aesthetic pitfalls associated with baggier cuts, this could be the best option. The slightly slimmer leg almost always looks better on men, compared to the flapping fabric of the previous options. Also, if you're a guy carrying some excess weight, this style could be a good choice. It offers some extra material, compared to the later options in this article, whilst still looking quite good. These are a great look for most guys of average build, not just those who are 'slim'. They offer a modern, more tailored aesthetic which highlights your physique, without the extremity of some of the tighter styles of jeans. Slim Taper in particular offer a great aesthetic for slimmer legs; with the shoes also being clearly on display. Both of these jeans are going to remain in style for many years to come. Overall, highly recommended, choose whichever you prefer - my pick are the tapered ones. This can be a good choice for thinner men. When I was younger, I had incredibly thin legs; to the extent where skinny jeans on my legs, looked like slim jeans on an average guys legs. The tighter fit allows smaller legs to still somewhat fill the material, making them look proportionally wider. That being said, for bigger guys, skinny jeans can look awful. There's nothing worse than looking like you're about to bust out of your clothing, with skinny jeans offering very little room to manoeuvre. Whilst these do have a place, I'm not sure it's in menswear. These rarely look good on anyone, due to the extremity of the fit, which often throws the body's proportions out of the window. I've seen too many guys looking like they have cocktail sticks for legs, for me to recommend these. They're the epitome of a trend, which is probably not going to hold up well over time. If you're incredibly thin, or an actual skeleton, these could be an option...but otherwise steer clear. In this men's jeans fit guide video, I showcase each of the readily available fittings and styles of jeans for men. At the end of the men's jeans guide, I also recommend you the best options for each physique and body type.